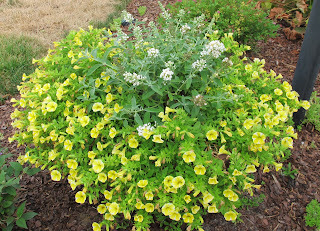 Welcome to Garden Bloggers' Bloom Day for July 2012. Here in my USDA Hardiness Zone 6a garden in central Indiana we are enduring a hot, dry summer. Weather record keepers have been busy recording new record high temperatures, record streaks of days over 90 F, and record numbers of consecutive days without any measurable rainfall. They have also declared that we are now in extreme drought rather than severe drought. As of noon on Friday, we are banned from watering lawns, washing cars or anything else outside with water, or otherwise running water out the end of a hose as though it is a resource that will always be there. We are allowed to hand water flower beds, vegetable gardens and any trees and shrubs that are less than five years old. In spite of all that, I do have blooms in my garden. 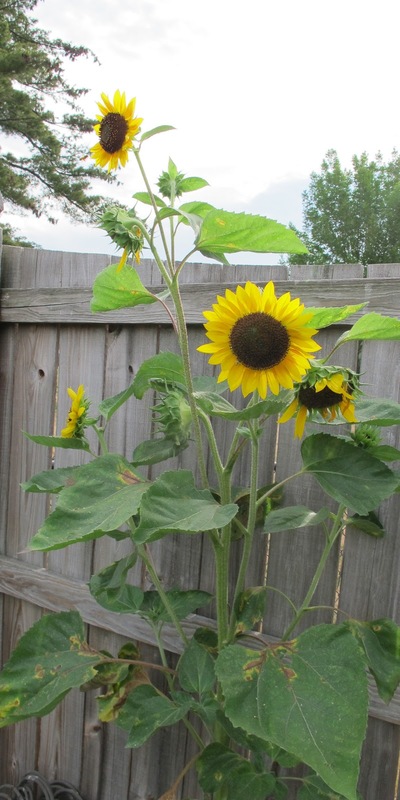 A volunteer sunflower came up this spring and I left it to grow because I am a lazy weeder. It is in a corner of the vegetable garden that didn't get a lot of water even when I used a sprinkler to water the entire garden. I wonder if it would have waited another year to sprout if it had known what the weather would be like this summer? Grow, sunflower, grow! Another volunteer flower that comes up here and there and seems to do quite well with little water and less attention is Verbena bonariensis. I just wish I had more of these scattered here and there because in some gardens, like Ploppers' Field, there is a sad lack of bloom. I'll let the seeds of this Verbena mature and sow themselves throughout the garden. 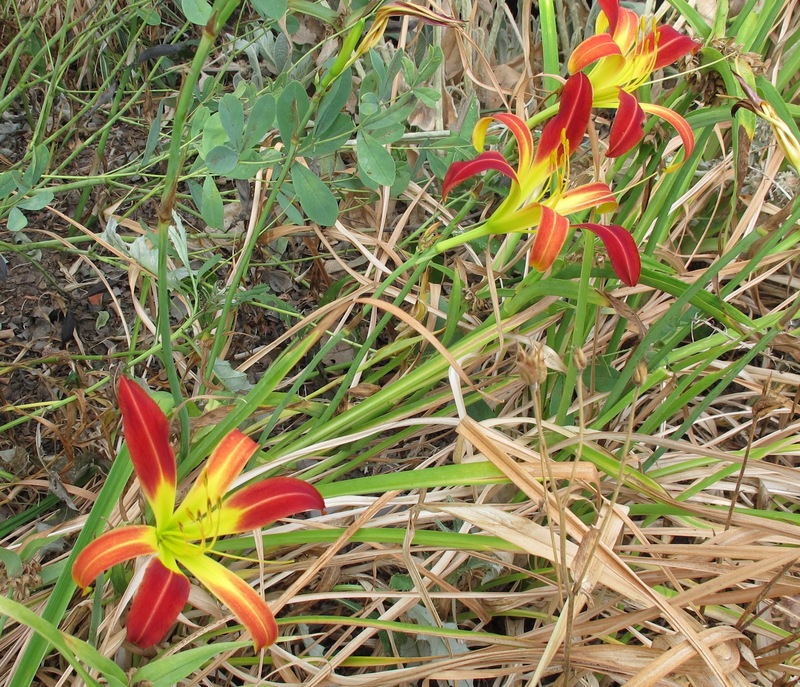 The few flowers that are blooming in Ploppers' Field, like this daylily, are surrounded by "not pretty" which can look worse than weeds. I do need to get out into the garden and do some massive clean up and weeding. The garden will still be dry afterward, but it will at least look neat and tidy. 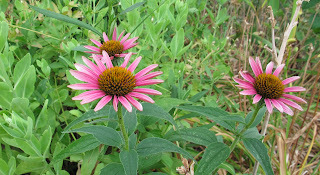 Elsewhere in Ploppers' Field, there are some coneflowers, Echinacea purpurea, in bloom. I won't be deadheading these anytime soon. The birds will enjoy the seeds for dinner later this fall. Across the way in the August Dreams Garden border, there are some bright spots. 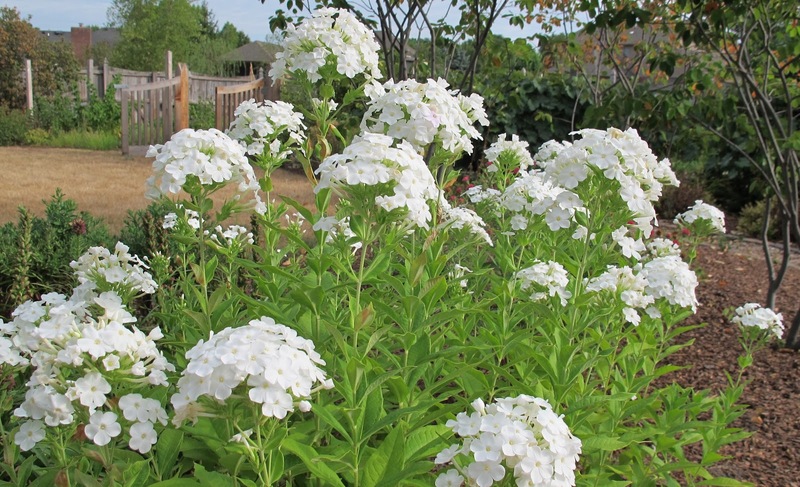 Phlox paniculata 'David' looks cheery and even glows at night. I've been watering this garden border because everything in it was just planted at the beginning of last year's gardening season so it is still establishing iteself. That tan area you see in the upper left is the dormant lawn, by the way. Rudbeckia sp. is also blooming now as it should be blooming. It, too, stands out against the dormant lawn. Around in front, there are also some blooms, mostly in containers which I planted with some Proven Winners trial plants. I have no idea where the tags are for these flowers but I am pretty certain that the two plants in this container are Lo & Behold® 'Ice Chip' butterfly bush and Calibrachoa 'Lemon Slice'. 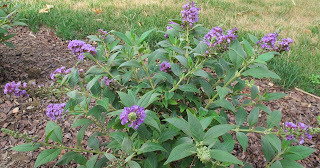 I'll plant the butterfly bush out in the garden some time this fall. 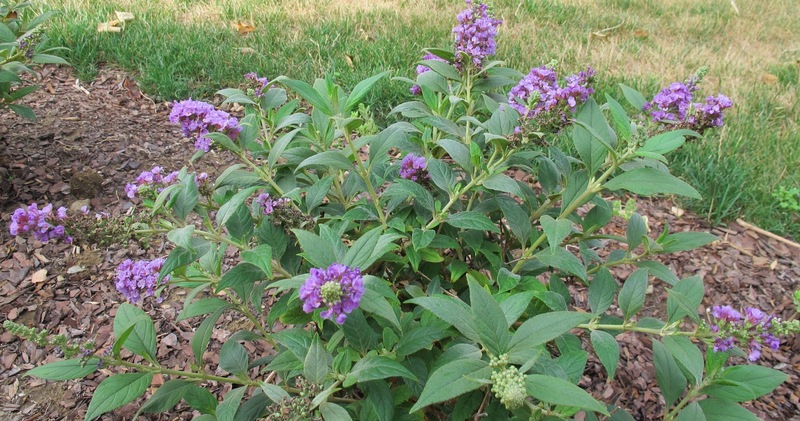 Also blooming in the front are Lo & Behold® 'Blue Chip' butterfly bushes. I bought six of these in early June to replace some Aster 'October Skies' plants that were dying off from some kind of blight. The butterfly bushes were a bit scraggly when I planted them, but I've been watering them regularly and they've responded with beautiful blooms. I'll see how they get through the winter before I truly sing their praises, but for now, they are a bright bloom in this season of dull drought. The rest of the garden is dry and the blooms are mere shadows of what would normally be blooming in mid-July in my garden. I looked back through all of the previous July bloom day posts, going all the way back to 2007, just to remember that it wasn't always like this. What's blooming in your garden in mid-July? I'd love to see and read about whatever it is that brightens your garden on the 15th of every month. Please join in with your own Garden Bloggers' Bloom Day post. 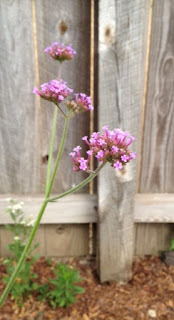 Just post on your blog about what is blooming this month in your garden and then come back here and leave a link to your blog post in the Mr. Linky widget below along with a brief comment to entice us to virtually visit your garden. The rules for Garden Blogger’s Bloom Day are simple... no rules! You can include pictures, lists, no lists, common names, botanical names, whatever you’d like to do to showcase your blooms. You can post early, you can post late. We are grateful for whatever you share with us. Thank you, and all are welcome! We have been experiencing similar weather here in zone 7a, but we finally got some rain today. It has not gotten as bad as water restrictions...yet. Your garden is surviving well despite all of that. Thanks for hosting. Oh, I'm sorry about the drought! That, combined with the heat, must be a true challenge for your garden. 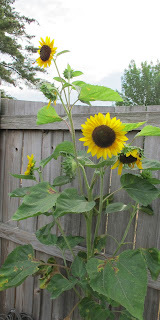 So happy to see that the sunflower came up anyway. I am so sorry you have all the problems with extreme drought, over here in Britain we have the opposite problem with too much rain and flood in almost every county! You do have some really pretty flowers though, love your Echinaceas, mine have barely got buds yet. Happy Bloggers’ Bloom Day! We're only in severe drought mode. We can still water but no grilling! You still have lots happening considering how bad conditions are. It has been a hot summer here as well with temperatures heading towards the 90's again next week. Your sunflowers and Echinaecea are doing well despite the heat and drought. The dwarf Butterfly Bushes are great. I bought the Lo & Behold Blue Clip last year and it is thriving in zone 7 so yours should do OK. Happy GBBD and thanks for hosting! Carol, can you delete #6 above? I accidentally entered the wrong link. #7 is actually my garden blog. Thanks. And thanks for hosting Bloom Day once again. I see we have several blooms in common this month. This has definitely been a tough year for blooms, but I have a few volunteer sunflowers in my garden also :) I only wish their blooms lasted a little longer! Happy GBBD! As hot and dry as its been in the Chicago area, we're mindful it's much worse south of us, Carol. A neighbor has Verbena bonariensis blooming beautifully in part sun, and that's got me thinking . . . such a pretty thing! Thank you for hosting Bloom Day Carol. I do hope some generous rains bless your garden very soon. Sorry to hear about your drought. In Santa Fe, we haven't been able to wash cars with a hose for a few years now and the car washes use recycled water. I hope you see some rain and some more flowers soon. Thank you for hosting Bloom Day! I'm sorry to hear you're having a dry hot summer. In my climate we know drought all to well. I hope you get some good rain soon to help your garden (and the farmer's crops). You still manage to have some beauty in your garden. Hang in there, I'm praying for rain for you! Our summer is fairly cool so far. Sorry for your extreme weather. You have lots of pretties nonetheless - and that rudbeckia photo is amazing, they really pop. Thanks as ever! We had a serious extended drought with severe water restrictions until just before our floods early last year. (Nature definitely has a sense of irony). Hope it doesn't last too long for you. You have some great blooms notwithstanding. I especially love the cheeriness of the sunflower, echinacea and rudbeckia. We could do with a little bit of dryness over here in the soggy UK! Mind you, everything is looking very lush here while you are obviously struggling with heat and drought. Still a good collection on show, though. Carol - you have extreme drought and we have extreme rain! We've had the wettest 3 months on record, which isn't helping the blooms either. I've been spending the time musing on what to do with the area of the garden I cleared of conifers earlier on in the year. I have to apologise. I spent most of my post complaining about all the rain we have had and then I see you are not getting any. I wish I could send you some. Can we do a swap with the weather please? We could do with some sunshine and warmth as John has just said. So much for imposing a drought order on us in April, it has rained almost everyday since! Your echinacea are weeks ahead of ours, our low temperatures and high rainfall have slowed down the garden a lot this year. 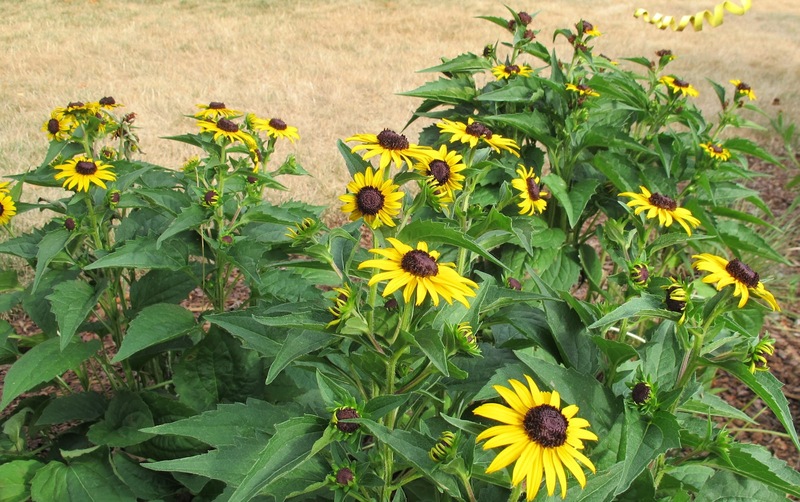 Love your rudbeckia. Crazy weather patterns and we're both suffering from extremes. You can't have enough Verbena bonariensis - mine managed to self seed over the winter and stay alive though nowhere near flowering stage. I know for sure that once that Verbena gets established in your garden it will look terrific in Plopper's field - perfect colour too for that area. You and Elizabeth are right, we can have blooms everys month of the year, or dried blooms. I feel your pain with this drought. It is amazing how some of the stalwarts have hung on to bloom. Happy GBBD. Happy Bloom Day Carol and everyone. As VP says above, we’ve had a rainy time of it here in the UK although England has had more than Scotland for a change. Poor Wales has had more than it usually gets. It's awful here also, just over a ways from you. Still no rain. I am very sorry that you are experiencing such a drought. Fortnately we have had a good amount of rain, but it rarely has fallen in a gentle manner. It has usually come in the form of violent storms. Regardless, the weeds have profited. I wish you rain and a happy GBBD. Your story reads like something that might have been written by a gardener in Texas last year. Fortunately it is all change this year. A little more rain than I care to see day after day. Feast or famine for gardeners. Happy bloom day. Oh the heat and drought has been rough this summer - and it's only mid July! Despite that, you still have some lovely blooms. I love that lily! Thank heavens for these tough survivors like rudbeckias and coneflowers. This summer is really teaching us what is strong enough to put up with crazy Midwest weather. Seeing your lawn in the background really emphasizes just how dry it is around here. Hope you got more than a few sprinkles yesterday, Carol, but we need several days of rain to make a difference. We have not been challenged with heat and drought, as some have, but still it has been hot and dry. The lawn is browning which is a rare happening, and while I know the lawn will recover, it is difficult to keep the vegetable garden watered and the flowers have to manage as best they can. It sounds dreadful (much the same here though we've had a little rain) and I'm afraid we're in for many more summers like this, so it's a good time to note the plants that do well in it! Verbena bonariensis is one of my favorites too - didn't include it in my post but it's scattered itself here and there and I'm happy to see it. Drought seems to be the name of the game in most areas of North America this summer. Despite that, you have lovely flowers and a good indication of what tolerates dry conditions! 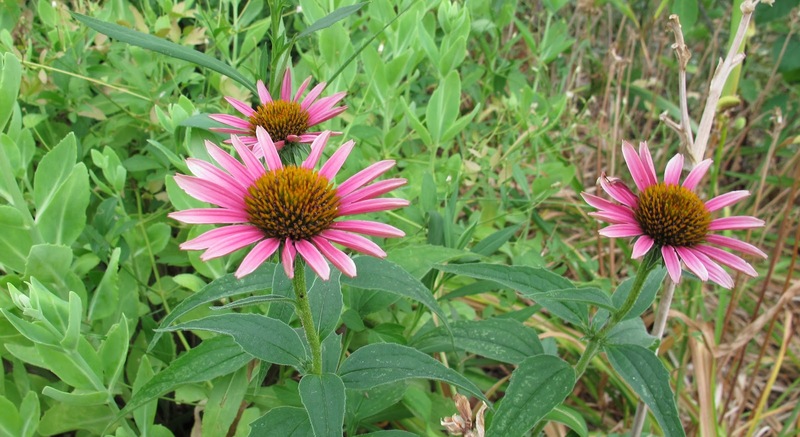 I may look into buying coneflower because it seems no worse for wear. Thanks for hosting Garden Blogger's Bloom Day! It's always something, I guess. But your rudbeckias and phlox really pop against the background of the dormant lawn. I like how it looks. Mike and I are from Chicago and we've got drought too. We figured out how to get a lot of rain though. We went camping in the Smoky Mountains and had rain almost all last week. Lots of rain. Lots and lots of rain. We hope it will follow us back home. My garden is zone 4 --such a bummer because I've always wanted to grow butterfly bush. I hope you get rain soon! It must be very hard to be so restricted on watering. The blooms you have look beautiful. Thank goodness for tough plants! And thanks for hosting. I feel your pain .... the dry weather leaves the garden looking so tired , hoping for some rain soon! I won't even bring the camera out to the garden right now! Your 'Lemon Slice' Calibrochoa are much more robust then mine. Also have mine in a container that I shared for today's Bloom Day selections, but mine are being taken over by a monster Colorblaze Coleus. Happy Garden Bloggers Bloom Day, Carol! Let's make the best of what is turning out to be a challenge on the garden front. In Nebraska, we are hot and dry as well. Last week, they asked us to voluntarily water on certain days of the week, according to whether our addresses are odd or even. Your phlox is lovely! I'm glad you were able to keep them healthy. Mine are shriveling, and I think they may be diseased. Sorry to hear about the drought in your area! We've been lucky enough to have rain lately, but last summer and the continuing overall drought in Texas inspired me to plant only survivors in the new garden. I like that you left the volunteer sunflowers up, too! Goldfinches love them. The white phlox and the rudbeckia are looking fabulous! I hope your weather returns to "average" soon. Thanks for hosting GBBD! Dry here, too. Record highs. A chance of a thunderstorm today but we really need at least two days of soaking rain. I believe even my rain barrel has gone dry. It is very hard for me to imagine what gardening under those drought conditions must be like! You are in full bloom as well. My Moonflower Vine bloomed last night for the 1st time and 1st year successfully!!! It's amazing that the flowers still put on a show for us whatever the weather. Hope that you see some of the wet stuff soon. My upstate NY garden (zone 5a) is in a drought situation right now too - ironic as we had historic floods last September - but lo and behold, it is raining as I write this. I hope you get some rain soon. Good luck! I'm off to watch the rain! I hear you on clean-up being needed, but hard to be motivated in this heat. Again, I must say, what you have really looks great considering you are having our weather, on and on. It looks nice and fresh! Yeah, dry here in Nova Scotia too, zone 5b. But surviving. Perhaps the lack of blooms out there will help us all cherish things like that spectacular day lily f yours, no matter what surrounds it. As always, thanks for posting and hosting GBBD. Well May Dreams Gardens obviously has had more rain than mine! Your flowers look lovely! Thanks for hosting. When I did my bloom day post today, it really made me appreciate a number of plants that I hadn't really noticed blooming. I hope bloom day has that effect for you. I hope your garden fares well with the drought. August Dreams Garden Border is a great title for a planting. Hi, Carol!! How many years has it been for the GBBD, anyway? We are so lucky in the Pacific Northwest: no lack of water and we're enjoying a dryish spell that has enticed all the sun-lovers into bloom. My favorites right now are the Agastache hybrids, and I show 'Acapulco Orange' today, along with a color wheel of other blossoms. Happy Bloom Day, Carol! The only reason my lawn doesn't look totally brown is thanks to the crabgrass! This month has been tough all around. You do have some pretty blooms, though, despite the terribly hot, dry weather. The weather has cooled and we had a half inch of rain last week. The rains are so spotty here with good rains falling on either side of us all week long. I am thankful that others are getting much needed rain but wish for a gentle rain for all of us. We are watering trees and shrubs so the lawn is full of circles of green. Thank you, Carol for Garden Bloggers' Bloom Day. Thanks to Elizabeth Lawrence for being your inspiration. It's a jumble out there with all this rain we have been getting. It's been raining this morning and comfortable cloud cover this afternoon. Great garden touring weather! I need to get back on the bloom wagon here! :) So here I am! Triple digits here last week in the San Joaquin Valley. Thursday's high was a blistering 109º! High temps are common here in the summer, and we should be used to it. We usually say at this time of year "At least it's a dry heat!" That's supposed to make us feel better! Happy Bloom Day! We are having the opposite issues in the Pacific Northwest. I'm still behind on my planting (and weeding), because it was such a cold and rainy Spring. I had to water last week for the first time all year. Trying to send some of our rain your way. I feel for you. I fear any day now, my town will ban watering with hoses. We're also in the extreme drought area. Thank goodness for prairie plants, or we'd have very little to look at. What crazy weather. We're getting rain here in Central Texas in July. This is very unusual, but definitely a huge improvement over last year's severe drought and heat wave. Hopefully things will improve for you soon. Same story here in southern Wisconsin. The Corn crop is toast. Not a fun summer for gardening, either. Thanks for hosting GBBD--your flowers are beautiful in spite of the heat/drought. We have pinched your rain here in the UK ...... we would be happy to give it back!! Dry here now too and how quickly the garden fades and suffers...not sure if there will be much blooming in a month if we don't get rain soon. I sure hope rain falls on your garden soon! My GBBD post is up! I hope you get some relief form your drought soon. We had similar conditions with record heat over 100 degrees but thankfully received some much needed rain last week. Still behind on the year but we're doing much better now. We had a furious storm yesterday with lightening strikes and wind and torrents of rain. The garden did not suffer and it cleaned out the algae from the pond - all good! What a morbid scale of drought, from severe to extreme. So sorry for your unseasonal dryness. A deferred project here is setting up a rainwater storage system. The Bloom Day records are a great yardstick for comparing past seasons. Hope you get drenched in August! We have been having that hot and dry weather also. It will be nice to have a break! You have my sympathy, Carol - and I am wishing as hard as I can that rain will come to you and all the other places that need it. My area had been in Exceptional last year, so it was actually an improvement when we got up to Severe drought. We have been temporarilly rescued by recent rains... hope you escape soon!! My GBBD post is up and only 1 day late. Wierd - well we must be getting your rain over here in Australia. This is supposed to be our dry season! You still had some beautiful blooms to showcase though! 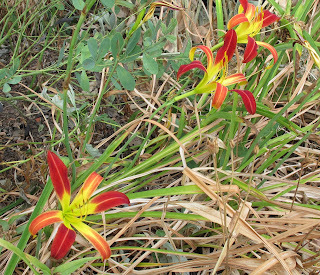 I'm glad some valiant plants are blooming for you, the daylily is really a bright red. I remember drought in San Diego, I would run the clothes washing water into 33 gallon garbage cans, then use it to flush toilets, so I could use clean water to water my plants. Here there is no summer rain but the temps are more moderate, and very cool at night, so not as hard on plants. I hope you get rain soon! thanks for hosting this meme, I'm really enjoying it. I do feel for you having such a hot dry summer, we went through that a few years back and you really find out which plants are the tough survivors. Like in Britain we've been having heaps of rain, even floods in some places. But it will change again. That's the only thing you can predict for sure - change! 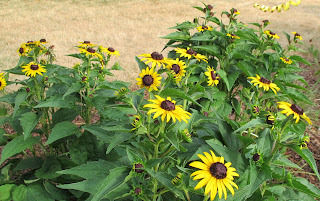 Rudbeckias and echinaceas are on my wishlist after seeing them in blogs like yours. Sorry to be late for my blogs first bloom day! Hope It's o.k. that I jumped in. The widespread drought is awful and I'm truly sorry for those of you who are experiencing it! Carol, thank you very much for hosting GBBD. So sorry to hear about the drought situation in Continental USA. We are hearing news about this every day now and about the home owned dairy farms. Hope it gets better soon. Could anybody help me with the name of the peonies in some of the earliger posts, I will be so glad! Please help!!! Some of you must have the same peonies.